That's me. Leah Marie Paige. There's a fine line between love and hate, sometimes they're one in the same. A brittle balance of stubborn wills and ego, if you will. The combination of past loves and severed friendships that leave YOU, your heart, your mind, your soul Wrecked. 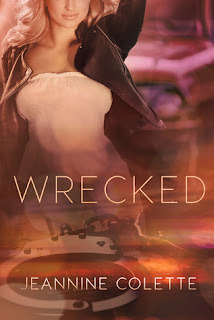 Jeannine Colette returns with Wrecked, a standalone story that is provocative while exuding such sweetness, tender, and fragile moments. A slow burn of flashbacks and fond memories... of the boy who got away... of the boy who lost the game of life. This is what contemporary romance is all about!! Bring on the drama and drown me in angst! Leah Paige has the reputation as a party girl, the town joke, and being a bar maid just adds fuel to the fire of the punchline that is her life in this small town in Iowa. Welcome to Cedar Springs, folks! Broody, sour faced Adam Reingold. He wasn't always this way. Seems life has a way of changing people. Traumatic, earth shattering events will harden the softest of men. Deep inside he hasn't changed much, nor did he forget any time spent with her. Her. Leah. His best friend's girlfriend. The highs and lows, ups and downs, through the twists and turns of life and their story I was sucked in from the first chapter. I had to know more. I had my hunches and suspicions, but never did I think =ALL OF THIS= would transpire. Holy. Freaking. Crap. Honestly, I'm in shock... perhaps its awe... I don't even know. I just can't even when it comes to Jeannine Colette!! Her words, the life she breathes into the story and characters. The way her words and magical prose makes you feel, it's as if you're living this book. GAH!! It's a book nerd's fantasy come to life. There's just so much to this book, the element of surprise, heartache, the clutching grip of all the angst. Sexual tension, quirky a-dork-able parents. It has it all!! Don't miss out on this un-put-down-able, addictive AF, TOP READ of 2017!! Heather McCallister wants one thing: A rich husband. When she catches her trust fund wielding boyfriend with his pants around his ankles she finds herself fighting over a taxi with a stranger she meets on the streets of Chicago. Ryan Pierson is handsome, fun and doesn’t have a penny to his name. The two embark on a wild night of passion that has Heather questioning what it is she wants out of life. But nothing is as perfect as it seems. A secret affair, a proposal and a surprise revelation have Heather facing the greatest dilemma . . . If you only read one book this year, read this one!!! From the cover, to the words within, there was not a single thing that I did not LOVE about this mighty little novella! It packs a punch, full of witty, sarcastic laced banter that is chock-full of attitude with a side of heart and all the gushy, angsty little feels that I have come to love experiencing from a stellar story. I seriously can't even right now. This is the kind of book I crave to indulge in! Though you really can't tell from my manic ramblings, I'm quite speechless at the moment. I'm simply floating in that mind blown euphoric state, THAT high feeling you get after devouring, one of the best books you've ever read. Yes, it was just THAT amazing. Sucked in, entranced and enthralled from the first page, I knew I was in for one heck of an amazing read! Goofy grin plastered on my face- check!, I dove in for the read of my year... sure it's early in 2017 but let me tell you it's going to take something quite earth shattering and breath taking to knock Sinful Abandon from the top of my favourites list. Jeannine Colette has a true God given talent for the written word, each story is laced with such intricate and precise puns and plays on life. One, where a simple sentence can be taken in a variety of ways, all relating and continue to pertain to the story line at hand, a true authentic literary journey. 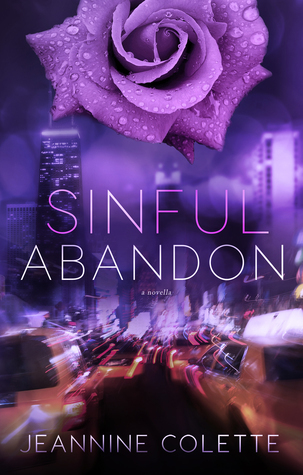 Sinful Abandon is just that, sinful. Heather's journey in life takes a bit of a turn after the handsome Ryan opens that cab door. This is a sinfully delicious story of love smacking you in the face *wink* You can try to fight it, resist it, but love always wins... or so we hope. But sometimes forever comes with a price. If you are looking for a beautiful, yet heart-wrenching story line with an ooooh sooo delicious slow burn, look no further! 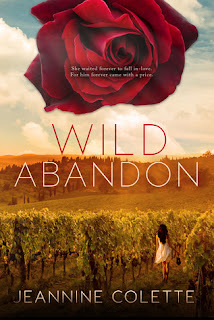 Wild Abandon *insert dreamy sigh here* is everything I did not know I was looking for in a book. This book... just...GAH! I adore every freaking thing about it!! "I kiss him for the first time. I kiss him for the last time. I kiss him forever." This is the first Book of Jeannine Colette's that I've read and it certainly won't be the last. Colette has such a way with words, one that captivates and consumes you. With the perfect combination of heart warming, melting and breaking moments mixed with the perfect amount of swoon and witty banter...it's just...well...Perfect!! One minute I'd be smiling, the next tears would be running down my face, then all of a sudden I'd be laughing. Wild Abandon is a true emotional roller-coaster ride through Napa Valley chalked full of All. The. Feels. Jeannine brought such life and realism to her characters. I couldn't help falling in love with Crystal, Nate and all of the secondary characters that make up a huge part of their journey to a Happily Ever After. "Love is like wine. You can't add sugar and mask the flavor, pretending it's something it's not. Love is like that. When you meet the right person, you'll know. And you won't be able to let go." At thirty, Crystal is looking for her forever love. After a short lived marriage and several failed dates courtesy of her many online dating apps, she packs her bags, temporarily leaving NYC for a life reboot near San Fransisco. "If he doesn't measure up, I won't settle down. Been there, done that, and it left me with a broken heart and an annulment." "Where I'm interested in love, marriage and a baby carriage, he's swindling it up at a bar." "If I never love again, I need this memory to take me through the lonely nights. I know you have a past, but I need you to treat me like I am your future. "I kiss him for the first time. I kiss hime for the last time. I kiss him forever." "If I never love again, I need this memory to take me through the lonely nights. I know you have a past, but I need you to treat me like I am your future."